The Gele is a traditional Nigerian Headwrap. It is worn during special occasions as an accessory to the traditional ‘iro’ (a wrap-around skirt) and ‘buba’ (a loose fitting blouse). Gele is usually made out of heavy or stiff fabric that can be wrapped and moulded into a specific shape. Fabrics from Switzerland and Austria are very popular, but the most popular and indigenous to the Yoruba is the ‘aso oke’. Aso Oke is originally a ceremonial fabric woven locally in Nigeria and is made up commonly of strands of cotton and/or silk. Aso Oke is also used to make Iro and Buba, but generally for very special occasions such as the brides wedding dress. Gele is becoming more and more significant. As more Nigerian women take pride in their culture and traditions, the attire becomes a huge part of their lifestyle. Nigerian women take great pride in their appearance, and the gele is their crowning glory. The gele can be outlandish or demure, depending on who is tying it and for what occasion it is being worn. 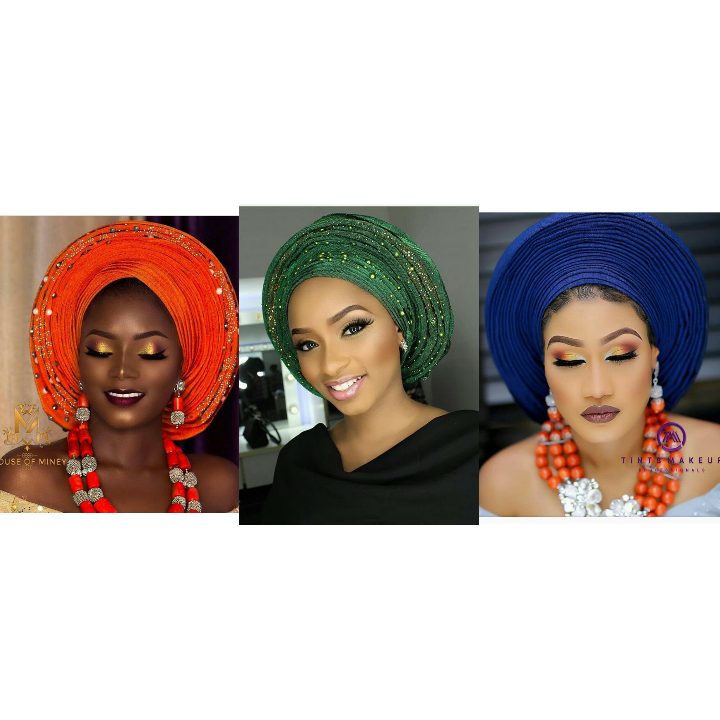 From my mother’s conservative styles, via the comically outlandish costume of “Madam”, to our ever fashionable crowns today, there is no doubt that the gele is a bold expression of femininity. In the Eighties, Western women had the power suit, Nigerian women had the Gele. This is a custom I hope never fade. 1. Begin by folding the end of the gele, this will ensure there is a smooth base at the front (crown of your head). 2. Take the and gele and wrap it around your head from the back to the front (Towards the middle of your forehead) ensuring that the end and the front are equal. This aspect is very important. 3. Then take one side of the gele, e.g the left side, and the wrap it towards your right all the way round to the back of your head and secure it with your right hand . At this point, the left side of the gele will be shorter than that of the right side. 5. At the side & back of the gele, begin to arrange it, measuring the gele around the head in levels and layer… Begin to squeeze the ends to form a fan from the middle of the layout, ensuring that the left over at the closest to you is enough to grip. 7. Secure the grip by tying both ends closest to you into a knot twice and nearly tucking in the loose bits. 9 . then move to the layers at the front. Start making lines and pleats forming layered steps at the front of the gele with your fingers. Be sure to try to make them as defined as possible. 10. Push the gele back as desired away from the face to give the face a lift. Be sure not to pun back excessively as to prevent the gele from falling off our head. Also be sure not to pull your ears out of the gele. Viola! That’s just how to tie gele.